It may not look all that exciting, but for the £100 asking price the Cambridge Audio Minx Go more than delivers the aural excitement. Booming bass considering the small scale proves that budget audio systems needn't sound bad. Some crunchy high-end is its low point, but otherwise there's a lot of lovin' to be had. Minx isn't a word that typically rouses thoughts of speaker systems. Cambridge Audio begs to differ. Its Minx Go portable Bluetooth speaker system is a chunk of plastic that's been flirting in and around the Pocket-lint offices for a couple of weeks. But can a £100 speaker system bring aural pleasures galore or is its price an indication of its limits? We must admit, we weren't that excited about the Cambridge Audio Minx Go's looks at first. It's functional, portable and well designed in many respects. But it just didn't excite, at first. Our mucky fingers left marks galore on the plastic exterior which left something to be desired. But it's a grower. The Minx Go has been all over the place during testing - it's been living on the windowsill, office desk, kitchen table and even in the park (that's right, we got over our apparent tech vanity and took it for an outside venture) - and we've come to appreciate its straightforward design. After all, a speaker system such as this doesn't need to be the centre of attention and the small, portable scale means it sits well in a multitude of spaces. It took its time but we were converted. This is a £100 device, so premium materials were never going to be on the list. But that's not to say the Minx Go is badly built by any means: there's a sturdy mesh to cover up the twin speakers and twin tweeter units, while a two-part plastic shell locks down the rest of the design. On top there's a trio of buttons to handle power and volume, while the rear has a 3.5mm jack input and both USB and DC charging ports. There's also a rear kick-stand-like support to give extra support, although it doesn't have to be in its outward position for the unit to stay firmly upright. It's solid. And the battery life is also suitably solid, with an 18-hour life per full charge - which measured up to expectations in our testing. The Go keeps on delivering hour after hour. Good work for a Bluetooth device. But the real important stuff is the sound quality. Typically we'd assume that £100 wasn't going to sound "good". But we had to eat our words: we're yet to see a stronger, bassier output at this price point. Good it may be, but it couldn't be termed great in the wider picture of audio excellence. The main issue is that the tweeters can push out a slightly distorted signal which can deliver a bit of a "crunchy" listen. It's not a permanent problem, and for £100 it's arguably not a problem whatsoever. But, still, it's something that caught us out from time to time. The Minx Go's big plus is its bass output. The rear of the unit has a "bass radiator" that can be seen vibrating like crazy as it thumps out those cutting kick drums and low-end basslines. Despite the vibration the unit stays sat tight and doesn't bounce around the desk. Although Cambridge Audio doesn't provide frequency delivery rates on its spec sheet, there's plenty of welly behind low-end - just not to those ultra-low sub-bass frequencies. With the forward-facing output and relatively tight arrangement across the 23cm-wide front there's also an audio sweet spot that's far tighter than something like the expansive multi-directional output of the Ultimate Ears UE Boom. Difference is that the Cambridge Audio has got more physical space to play with so it can deliver more cutting bass in its mix, even if the audio is the more one-directional of the two devices. Strike a listening angle that's too skewed to the Minx Go's front and those tweeters sound too pushed up in the mix too. And without bass and treble control that's just something you'll have to live with. When it comes to connecting a Bluetooth device - or there's a 3.5mm jack on the rear - we found it super-easy. We've fired over music using AirPlay via an iPhone and Bluetooth via an HTC One each with no issues at all. Even when in another room we found that the signal remained strong over a decent range. It booms, it bangs, it delivers all kinds of brilliance given of its affordable price point. A generally comfortable, decent listen with plenty of output power. It might not astound stringent audio fanatics, but for the money it's undeniably impressive. 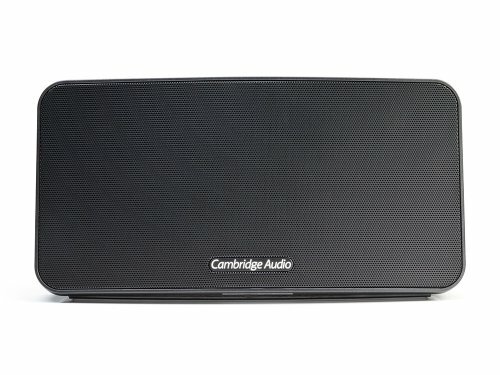 The Cambridge Audio Minx Go is proof that budget audio systems needn't sound poor nor quiet. Considering the £100 price tag the booming bass and loud audio that spills from the unit is impressive. Perfect? No - its tweeters are a little crunchy for some listens, but positioned correctly - and you'll want to be in its front-facing sweet spot - and this won't be a huge problem. There's a lot of choice out there when it comes to Bluetooth speakers, and while the Minx Go doesn't astound the eyes it makes up for it by tickling the ears and leaving cash in your wallet. It's a great budget audio system, despite its namesake misnomer.